NOW 150 EXCLUSIVE LEVELS! 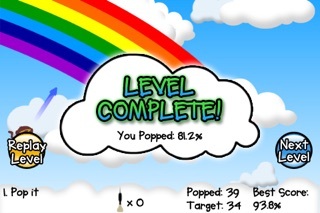 ****************************************** Follow Bloons on Twitter to receive the latest information at http://twitter.com/bloonsiphone Walkthrough for the first level pack: http://ninjakiwi.com/blog/bloons-iphone-walkthrough-part-1-of-5 Walkthrough for the second level pack: http://ninjakiwi.com/blog/bloons-iphone-expansion-walkthrough-part-1-of-5 Recommendations: Pocketgamer 8/10 - Silver Award "Bloons on iPhone is the definitive article" TheAppEra - "Still flashy without flash" ------------------------------------------ Bloons, the online flash sensation has finally landed on iPhone and iPod touch! 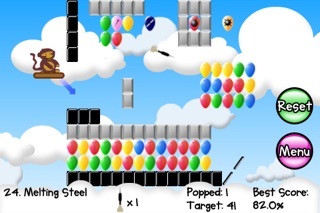 Play as the mischievous monkey as you set out to pop as many balloons as possible using an arsenal of darts and special power ups. 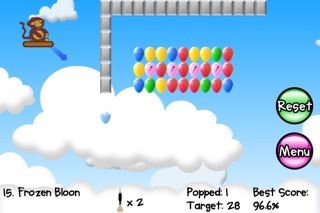 Bloons is a simple yet hugely addictive game in which players must pop a target number of balloons in each level in order to progress to the next. 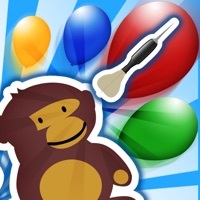 Requiring skill, determination and a little bit of monkey magic, Bloons is a puzzling skill game which will have you begging for just one more go! 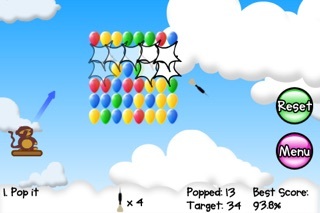 Fans of the online game and those yet to experience the Bloons phenomenon are sure to enjoy this iPhone conversion. 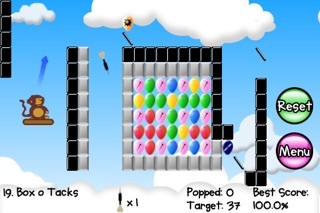 Featuring: * All of the original Bloons favorites such as ice bloons, bomb bloons, tack bloons and helium bloons. * 150 brand new levels exclusive to iPhone and iPod touch. You simply cannot experience these new levels anywhere else! * Level Editor - allowing you to customise and store your own levels. * Unlimited Darts mode. * Simple pick up and play control system allowing players of all ages and skill levels to enjoy the game. * Bonus hidden content which can be unlocked. Update this! I paid for it! You should update the app so it works on news OS’s. Classic, if you played this as a kid you'll love it. Otherwise looks for a more recent game. Can't believe I paid for this app. There's only one level pack, which is ridiculous. Don't waste your money. The game is great, but the monkey sometimes moves on the custom levels from where it was saved to a new spot.